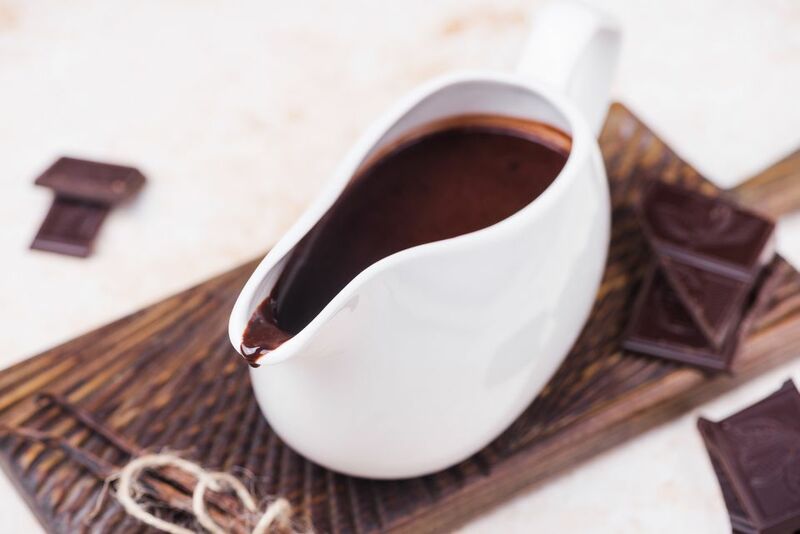 This is the easiest chocolate sauce recipe! You only need 3 ingredients for this delicious sauce. It's a combination of chocolate chips, whipping cream, and some vanilla extract. Once you know how to master this sauce, you'll be making it for ice cream parties, dessert toppings, or anything else. Serve this rich sauce over ice cream or drizzle it over a dessert or cake. In a small saucepan over low heat, heat the chocolate chips and whipping cream, stirring constantly. Continue to cook while stirring constantly, until the chocolate chips have melted and the sauce is smooth. Remove the sauce from the heat and add the vanilla extract. Stir to blend. Serve the sauce warm or cooled over dessert or ice cream. This recipe makes about 1 1/4 cups and can easily be increased, if you need. Make this warm chocolate sauce as part of a decadent dessert sundae bar. For a divine dessert, gather all your favorite ice cream flavors plus toppings. Some favorite toppings include sprinkles, crushed cookies (like Oreos), wet walnuts, whipped cream, and cherries (of course). Have ice cream dishes and cones on hand. Then let your guests make their favorite sundae toppings. Another creative way to use this rich sauce is as a dessert dip, in the style of fondue. Put the warm chocolate sauce in a bowl and serve it with fresh (or dried) fruit skewers, cookies, pretzel rods, or even potato chips. Anything that pairs well with chocolate (from sweet to salty) and is relatively easy to dip would work well dipped into this decadent sauce. If you use the sauce as a dip, you'll not likely want to keep any leftover sauce. Once food has been dipped into the sauce (and likely had bits fall into it), it's not worth saving. If you want to add some other flavoring, try a small sprinkle of cinnamon. You'll just need to make sure the cinnamon is fully incorporated into the sauce and does not leave any lumps. For a surprising variation on this recipe, you can make a white chocolate sauce. Simply replace the semisweet chocolate chips with high-quality white chocolate chips. If you want to leave the color a pure white, omit the vanilla extract. If you don't mind a darker color white with the rich taste of vanilla extract, leave it in. If you have any leftover chocolate sauce, you can store it in a sealed container in the refrigerator. You can reheat a small amount in the microwave or reheat the entire batch in a small saucepan over low heat.